This profound sentence from Pope Benedict tells us that a Christian is someone who has met the Risen Lord and whose hearts have been conquered with His love. When you claim to be a Christian, you are saying that Jesus is not simply someone who lived over 2000 years ago, but that He lives and you have met Him. From St. Faustina’s Diary, we have learnt how she met Jesus so many times. We have read about the extraordinary meetings with Christ in the lives of the holiest saints, like Padre Pio. But what about us in our daily struggles with sin? We can often feel that if we could only become exceptionally holy, then we might be worthy to meet the Lord. However, there is a more obvious way to meet the Lord. We meet Jesus because we are sinners in need of His healing mercy. Our sins and weaknesses can be vehicles through which we meet the Risen Lord in His infinite love and mercy. 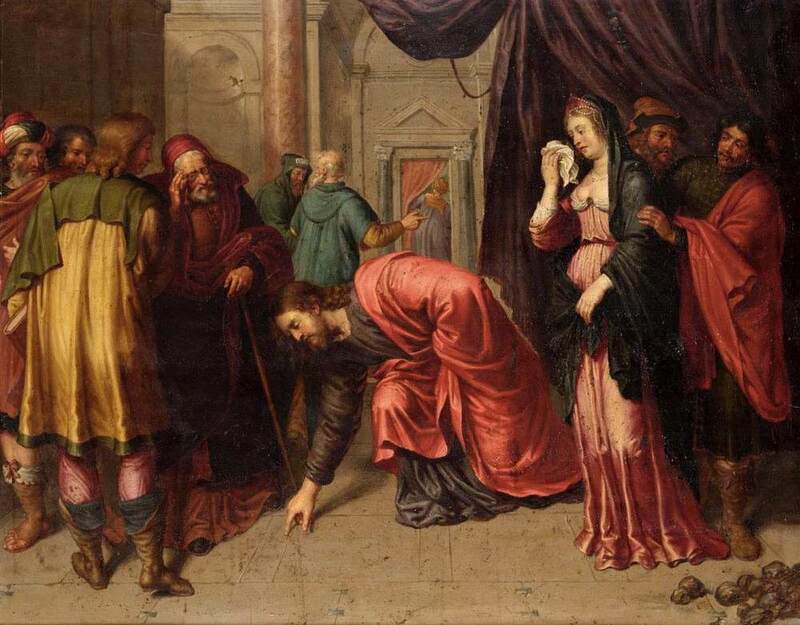 One morning, the Scribes and Pharisees brought a woman who had been “caught” in adultery to the Temple where Jesus. The Law of Moses stated clearly that a woman caught committing adultery should be stoned to death. They wanted to test Him. If He went against the Law, then they could destroy His reputation with the Jewish people. One thing is clear from St. John’s account was that the woman was only a tactical ploy in the war against Jesus. But, for this woman, it was very real. Her private sin had now become a public scandal, and she was about to be stoned to death by an angry mob of violent, manipulative men. She must have had no hope, knowing she was guilty. When they presented the case to Jesus, she had no defense. It was an open and shut case. As she stood before Jesus, He did not ask any questions. He accepted that she was guilty. Then He did a strange thing. He knelt down and started to write on the ground with his finger. They kept on questioning Him but He did not answer. Then He stood up and said to them, “Let he who is without sin cast the first stone”. One by one they left, leaving her alone with Jesus. The woman must have been in a total state of shock. She was about to suffer the most horrific death, but Jesus had defeated her enemies. What must she have felt when she heard Jesus say, “Neither do I condemn you. Go, and sin no more.” How did she feel as she walked out of the Temple on her way home? It must have felt like a dream. I have often wondered if that woman, years later, as she reflected on her life, was grateful for getting caught committing adultery? This moment in her life brought her to Jesus where she experienced His love and mercy. Often is it our sins and weaknesses that bring us to Jesus. We are tempted to think that if we were very good, if we kept all the commandments, if we never said or did anything sinful then God could love us. We want to stand and look at God in the eye and accept His love because we deserve it. But we can never meet God on equal footing. We can never be so good and perfect that we feel secure before God on our own terms. We will always stand before Him in need of His love and mercy. It is precisely because we are in need of God’s love and mercy that we can meet Christ. The Scribes and Pharisees were in the presence of Christ but they were not open to Him and, in that sense, they never truly met Him. They did not need His love and mercy therefore they never encountered Him. However the woman caught in adultery, because she was a sinner, needed Christ to be merciful and loving and thus she met Him. Very often our sins can be like the Scribes and the Pharisees, screaming that we be condemned, demanding that we be denounced by God. But our sins can also be the very things that bring us into the forgiving presence of Christ. Our sins rather than keeping us from Christ, can be the very excuses we have to come before the Lord and seek His presence in our lives. Such a moment of totally immersing ourselves into the mercy of God comes when we go to Confession. This holy sacrament is the only place in the world where we know we are loved. No matter what we have said or done, all those things we are ashamed of, things we would hate other people to know, when we say them in the sacrament we know that we will be forgiven and set free. We leave the confessional knowing that we are loved. When you prepare to go to Confession, immerse yourself in that love which is the living presence of Christ coming to you to set you free. Jesus suffered on Calvary and rose from the dead in order to make God’s love for you a reality in your life’s journey. The Church herself, the provider of the sacraments, is here for you, so that you can meet Christ and have your heart conquered by his love. Rather than our sins being reasons for us to flee from Jesus, let them be the very things that carry us to the loving mercy of Christ.